Alex J. Cavanaugh: Star Trek Christmas Gifts, IWSG Update, CheersFest 2.0, and Ninja News! Thanks for another awesome IWSG day last week! Please note I do cull the list and remove those who haven’t posted in two months. However, the list is so big, that even with co-hosts, I miss blogs. (Sorry, I’ve just not found a way to visit all of them yet!) If you are removed from the list, you can rejoin at any time. There are a lot of people posting who are NOT on the list! Please take a moment to make sure your blog is on the list. You’ll get so much more out of it if people can find you. I am also in need of co-hosts next year. If you can co-host on January 8, February 5, or March 5, let me know in the comments. And here’s a little tip on what NOT to do on IWSG day. Don’t click on the Mark all as Read check instead of the Refresh button in Feedly first thing in the morning. Yeah, I did that. Crap! So if I missed any of my blogger buddies (because of course it was THAT folder) I apologize. The awesome Pat Hatt at It’s Rhyme Time hit 1000 posts and is hosting a giveaway – and it’s one hundred dollars! Visit his site for details. Congratulations, Pat! 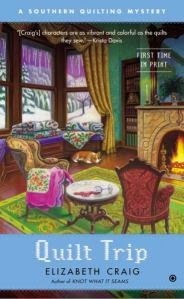 The amazing Elizabeth S. Craig has another cozy mystery out now - Quilt Trip. It’s third of the Southern Quilting Mysteries and you can find it everywhere retail, including Amazon. Congratulations, Elizabeth! Heather Gardner at Waiting is the Hardest Part is featuring a Pay it Forward Book List. Many of you have already been suggested, and you can in turn suggest a book. Check it out! And I won the Dr. Who caption contest at The Geek Twins! Hosted by Mark “Madman” Koopmans, Alex “Clone me a” Cavanaugh, Morg “the Borg” Shamy, Stephen “Wormhole” Tremp, and David “Don’t Mess with the” King. This year, we are celebrating the man of the hour, or rather the alphabet, Arlee Bird (Lee) of Tossing it Out! As a child, he was obsessed with Alphabet Soup. Yes, it’s worth two turtledoves in the bush and a partridge in a pear tree! Combine the intensity of Tommy Lee Jones, the quiet composure of Paul Newman, and the juggling skill of Ghandi and you got it! Through the smoke filled room, Veteran cop Lee saw the juggler sprawled on the ground. Beaten to death by bowling pin. Not a pretty sight. And now he had to question the suspects - three colorful birds who were part of the act. Reaching into his brown jacket, he pulled out a notepad. See any Star Trek gifts you’d like? Enjoy the IWSG last week? Enter the contest? See any good books? And what fine words would you use to describe this year’s CheersFest roastee, Lee? You hit that Bird right out of the ballpark! Loved your story with a surprise ending, and the caption was hilarious! Who knew that Gandhi could juggle?! I think that you need to take your act straight to Vaudeville with Lee! Great Flash Fiction. Toucan play at that game - ha, ha, ha, very clever. You're gonna make some Star Trek geeks very happy. I'll take a glass of Star Trek wine, please. Did you know there's also a Star Trek cook book? Toucan-too fun! Love your Flash Fiction-Lee will love it too! Wow such a great post, roasting a cool man... blog man, Lee... I must get me some of the Star Trek stuff, I love the shower curtain... Mrs. Retro would never let me. Congrats to your Geek Twin Win! Sorry to everyone my lack of visits this last month and my lame ghost-posts... in my defense I still have been able to help art up a few things. Have a great day to everyone and Lee... you are the king for the day, week... year! Love the Star Trek stuff, the curtain would look great in a media room! Congrats to Lee, I haven't had the time to organize my post, so I must apologize for not participating as promised. All the best Lee, you are the wheels behind A-Z of which we are all very appreciative. Enjoy the roast! Julie, Ghandi was an excellent juggler! Ella, pizza and wine sound great. Jeremy, you have been busy, and I've appreciated you stopping by when you could. I had no idea there were so many Star Trek products! Those were some great gift ideas and a great post honoring Arlee! I'm still laughing. I had a feeling that the Butler was a juggler. :) I just found out a few days ago about the Cheers to Arlee and working on an "unofficial" post to toast him. I remember AlexFest very well - glad to see Lee in the "hot seat" this time! He certainly deserves the roas - the recognition! Those are all very cool Star Trek geek gifts, and I'm not even a Trekkie! Congrats to River and Elizabeth. Checking out Heather's book list and Pat's site. congrats to him also. Thanks so much for highlighting my book! 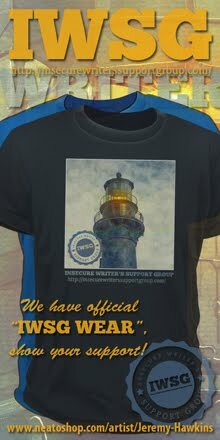 I'm happy to be a co-host for IWSG. You pick the date you need. Star Trek geek gifts! I'm drooling now. I'm going to have to get myself something from those featured. I like the curtain and the wine! Congrats to Lee on the roasting. Congrats on the Caption win. I always enjoy the first Wed. It does make your head spin! I must own that shower curtain... my mind is reeling with all of the possible geeky jokes and antics you could use that for. Eep! Mildly terrified to do so, but I can co-host! Any date is fine. Loved your flash fiction. Very funny. Since I haven't been blogging a full year, I've never seen Cheersfest, but will look into it this year. IWSG was remarkabe. I'm finishing up The Book Thief and it's a fantastic read, I'd suggest to it everyone. You know, last year they had a gold-plated Enterprise pizza cutter at Think Geek. For the truly obsessed. Elizabeth, you're welcome! And there will be a bit of a mystery in my next story. Gossip Girl, he will appreciate that. Sign up anyway, even if it's not official. Trisha, I'm glad it's him and not me now! River, you're welcome, and thank you. Donna, that made me laugh! David, it does make the head spin! Sheri, glad it's not just me. LG, roasted juggler - breakfast of champions! I like the curtain and the wine too. Wonder if we can find that wine in Canada. More interesting books. Diamonds and Dust is already in my library as the Jewel of Shaylar. Good story. I want that pizza cutter! Loved your second answer about balls! I like your Dr. Who caption! That's really generous of Pat on his $100 gift giveaway! Please note: I will accept any of those Star Trek items as gifts this year. I'm up for co-hosting, Alex. Any of the dates work for me - just let me know when and where I can help. Toucan play... *SNORT*! I love Elizabeth Craig's book title... Quilt Trip. That alone would get me to read it even though I'm not a big mystery reader. Now I gotta go find me a true-blue trekkie so I have an excuse to buy something, at least some wine! Don't click the read all, you crack me up. Love the Potato Men. There's a Wonder Woman one, I want. And she's in my cart on Amazon, to buy. So many choices and so many star trek geeks in the family. Perfect! Oh crap, I totally forgot that Arlee could beat us to death with a bowling pin when we posted our roast. 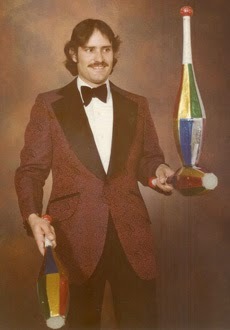 If we don't post again, you know why (he's juggling our severed heads). "Toucan play at that game" easily wins pun of the year. We bow down to you, sir. Love your play on words in this post - so much fun, Alex. Also, thanks for the wonderful ideas on Star Trek gifts - my brother is such a fan! Fun gift ideas! Thanks for all the links and news. It's great to hear what others are up to. Brian, those might be bottles you just have to save. Livia, I didn't cut you! Ivy, really, don't click it! Have fun with the roast. Arlee deserves it. He's a quiet, yet huge influence around these parts. Congrats to Elizabeth and River! Ha ha, Toucan play at that game. Love it. I like the Star Trek pizza cutter. It covers both of my loves: Star Trek and pizza. That Star Trek shower curtain is very cool. The Star Trek wine should be a real hit this time of year. I like the Star Trek pizza cutter too. Now that has real mass marketing potential. Lee's jacket is really making the joke circuit today. Congrats on winning the caption contest. Toucan?!? Ouch- that one was weapons grade! Color me punned. <<<----Toucan play at that game. Hahahahaha. Loved it. Yes, this is Star Trek really good wine! From another galaxy! Oh, those are some great gifts for Star Trek fans! 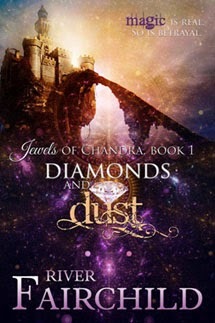 Love the cover of Diamonds and Dust by River Fairchild - congrats! Stephen, it was an easy target. Had my eye on that pizza cutter for a few years now. One day I'll pull that trigger. IWSG was great this month. That Star Trek shower curtain would make me believe I was about to be beamed up. If I could drink the Vinport I'd never come back down again. Hmmm bet that wine doesn't taste very well. lol yeah hope it has nothing to do with balls also. I'm sorry I missed IWSG. It bummed me out because it would've been a perfect time to write about it since my week was not the greatest, especially in the writing department. Congrats on winning the Dr. Who caption! Love it! *LOL* Hilarious story! I'd like a few of those Star Trek gifts. I've done all my online shopping, but with the snow storm that hit us, I'm still waiting on everything to be delivered. Ah yes, my mother did feed me a lot of alphabet soup when I was a kid and I sure did love it. You may be onto something there. "Toucan play at that game"? Bad ninja! HAH! Great job with the caption win! Very nice, Alex. I like the idea of his tossing the birds around, instead of pins. . . And Detective Lee, yes I could see that! PS I might want one of those 'beam me up Scotty shower curtains' I'm a Spock fan first and foremost. I wondered if you'd get a teleporting reference in there. . . I didn't know Ghandi juggled - LOL! I want that Star Trek shower curtain. Hahaha! Love your FF, Alex. I think noir may be your thing... new series idea? All your answers (and caption) were so funny. You always bring the wit! Congratulations to River on publishing her book today. I loved Diamonds & Dust. I like your Star Trek gift series and I wish you'd expand it to geek gift ideas. I have a really hard time finding gifts for people and legitimately use these kinds of lists to find gifts for "hard to buy" folks. I totally want those Mr. Potato Heads! How funny. Congrats on winning the caption contest and also on this flash fiction, love it. I'd be happy to host again in February or March, Alex. If you have others who want to no problem since I just did it, but if don't get enough responses and still need someone count me in. Lee, you no like the end of my story? DG, of course! I am all about teleportation. Julie, thanks - February would be perfect. I'm thinking that I need to have the Enterprise pizza cutter. Looking forward to reading Diamonds and Dust. Congrats River! Thank you for giving me the PERFECT gift idea for my Star Trek obsessed friend. Star Trek wine = genius! I love IWSG and was sad I couldn't post on time this month! I'll be sure to be better next time around. And I'm available to co-host if you need one for any of those dates still! I would love to try that wine. And having the Mr. Potato Head set wouldn't hurt either, hahahaha. I need someone to explain me what does "two on the bush" means. The irony of a translator needing a translator. 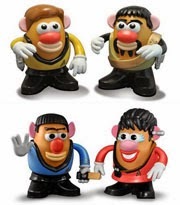 I'm not a trekky but I want a spock potato head. I love your flash fiction, Alex, especially the final line. Great work. Love the gift ideas you've been putting up. Thank you so much for mentioning the PIF Book List! Great flash fiction for Lee! Very well done. Murdered by birds, talk about bad luck. Your response to the bush question is my fave. Hilarious, you definitely did Lee right. 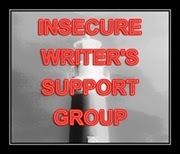 Congrats on another great IWSG and I'm available for February to co-host. You did a wonderful job here in connection with our wonderful blogman called Lee the Bird!! Thanks for the news Alex. I may just have to buy the Star Trek Enterprise Pizza cutter! Julie, no worries - and thanks! Al, it basically means that the one thing you possess is usually better than two things you don't. I love the Star Trek things - especially the shower curtain! And congrats on winning the Dr Who contest! I loved your flash fic for Arlee - too funny! Congrats Pat on 1000 posts! Congrats Elizabeth and River on book releases! Congrats Lee on being well and thoroughly roasted! First, I want that shower curtain. It will be perfect in my bathroom. Next, congrats on winning the Dr. Who caption contest! Yay for you. I'll add my best of luck for River and her book. Looks great. Sorry I couldn't join in the Cheersfest. This year through me a few too many curves. But I loved your contribution. Toucan always play and should. "Indie" is generally defined as anything not published by one of the big NY houses, so, yes, small (and even mid) publishers count as "indie." Self-publishing falls under the "indie" umbrella but is not all of it. 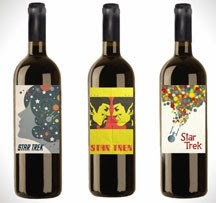 Star Trek wine, now that's clever marketing and I'd like that gift. But if anyone buys me Klingon blood wine, I'll slap them. Some quirky gift ideas there, I bet there are some fans who would love that shower curtain! Loved your Flash piece. Very clever. Like Jeremy, I love that Transporter Shower Curtain -- but with my luck, it would work! I love the potato heads. I think this is perfect for a treckie who has children. Gives them something to bond over. Toucan play at the game!??! Cap'n Ninja!! I should never have worn my corset! LOL!!!!!!!!!!!!!!!!!!!!!!!!!!!!!!!!!!! Oh I am totally fashionably late to the party!!! I am loving these ST gifts - especially the el vino bottles! How cool are they!?!? 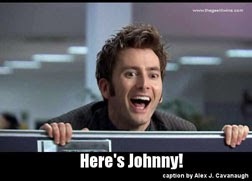 Yay for "here's Johnny"! and for Mr Lee!! Toucan play.. LOL!!!!!! Roland, but if it worked, that would be awesome. Kitty, glad I could make you laugh. Yay for Star Trek stuff. I love the Mr. Potato Heads. Those were great. Okay, I must own that pizza cutter! Sorry I didn't do IWSG last week, my life has been a tad crazy! Next month for sure. you're so awesome to still come to my blog even when I haven't been a good friend, glad to see everything going well! Senior Runner TwoSore Legs reporting for duty, Cap'n. You missed posts? I heard you were some type of blogging robot. Oo alphabet soup. Now I want some. I liked the wordplay of your flash fiction, too, but the caption was the best... "HELP ME". I think I visited about 75 blogs this week for IWSG. And it was actually some help to me, considering how emotional my emotions are these days! Congrats on winning that caption contest! Awesome roast post! It's so cool to visit everyone and see what they've come up with. Arlee Bird is a gem. I can't imagine a bloggerly life without the A to Z Challenge. Okay- I just got a lot of gift ideas for someone who is hard to buy for each year. Thanks for all the Star Trek ideas! So fun! Also- love the reason Lee came up with A-Z! Star Trek geek? Make it so, number two. IWSG aka, um never mind....No need to cull me. Pat in the Hatt and 1000 posts and plenty of boasts. Well done him and the rhyming cat. How about that. River's book is worth a look. Well done to her. For sure. Well done on the Dr. Poo caption. Nice one in roasting Lee. Time to ban alphabet soup. What would words would I use to describe Lee? Starting with Z, I think he's zippy. Call me blind, but I went to the IWSG blog and couldn't find the list. Is it hiding somewhere? I see one of those gifts I must get for my daughter. Love Lee and am enjoying reading all the roast posts. I'm such a geek! hahaha. JE, the clones were slacking that day. Stephen! You remember those velour jackets! David, that's awesome to hear. Kimberly, no!! How can you be clueless when it comes to Trek? Get that book now. Gary, zippy? New way to describe Lee. Karen, look for the tabbed page under the header. The transporter shower curtain looks like fun! Whatever will they think of next? Awesome Cheersfest, Alex. It was fun joining in. I got a lot of my Christmas gifts from Think Geek this year. They have awesome stuff. I always enjoy the IWSG posts . . . look forward to it every month :-) If you're still in need of a co-host, it'd be my pleasure to help! You always have the most interesting posts, Alex. I am a Star Trek fan (old series and new ones). Love the pizza cutter and the shower curtain. I've just started watching the Big Bang Theory and won't be surprised to find these items showing up in an episode. Best wishes and much success to all those who have books coming out. No way I can top your toucan joke or the velour jacket line. Have you ever considered being a comedy writer? And Star Trek! I'm old enough to have grown up on the original series (which I loved), and who'da thought that all these years later it would still be around and flourishing. Fun crazy Star Trek gifts! Congrats to Arlee! (2) One word on the flash fiction's ending line.....OUCH! Loved the flash; perfectly awesome, lol. Man, all that Star Trek stuff is cool. I love the shower curtain! Spacerguy, glad you could participate. Mason, I think some of those items do end up on the show. Helena, thanks, but I'm really not that funny. Grew up with the original as well. Still going strong! Larry, juggling was one of Ghandi's lesser known talents! Too bad I don't know a Star Trek geez. Wish you could help me figure out something cool & small to get my husband for Christmas. Wow, lots going on this time of year, and ever more on your blog. Love the shower curtain, if we didn't have glass doors. Great caption for Arlee's FB page. OMG! I want that shower curtain, and...yeah, all of them!!!! Thanks for showing us what's out there. I never would have thought to ask Amazon for a Start Trek shower curtain...but now I'm going to. Your flash fiction was BRILLIANT, but as I told KoolKoop (he got a new nickname in his comments yesterday), I don't think hosts can win, but that's only because I'm not hosting this thing. Although MJ and I have something "cooking" for a monthly bloghop. Stay tuned. And although I've been a part of IWSG for two months now, I'm definitely enjoying it -- I've gotten a lot of great support in my last post from last week. I'm only sorry that my schedule has been so insane that I have not been able to do much browsing and posting on all the other IWSG blogs. Also loved the Arlee roast answers! Congratulations for the prize in the subtitle Dr. Who! Alex, I made ​​a mistake progamar entries in my blog and published two yesterday and tomorrow. The "insatiable Flowers" has been deleted, your comment about this photo I'll post tomorrow with the photo. I beg you to accept my apology, thank you very much! LOVE the shower curtain! LOL!!! Oh my god! Where do I start with the Star Trek toys? The pizza cutter rocks. I like the wine too. Very cool. That's a great caption too. LOL! I'm heading over to try to win IWSG. Wish me luck! That pizza cutter will be mine. And I like the flash story. It's a parroty. I saw that shower curtain at Think Geek! I was so close to getting it for my parents. Love it! Happy Holidays Alex! I hope you are well. I want someone to tell my husband to get me that Star Trek Mr. Potato Head! I would like to eventually join the ISWG, but I don't want to join until I'm committed to post every month. Right now I'm lucky if I can get 5 posts out a month. Lots of baby time these days. Natalie, iPad Airs are small! Tina, thanks for offering! And looking forward to your bloghop. Chris, just glad you are a part of it now. Leovi, no problem! I'll just visit it again. Terri, not sure, but I will check. Cheers to Lee!!! Sorry I missed today. Your Cheerfest entry is amazing. Wow, that's clever flash fiction. You go dark, but it's fun too. I love the Star Trek curtain. Yay for geek gifts!! Bet you get a few, eh? I always enjoy the IWSG posts. Too many to visit. My commenters last week were especially encouraging which is what it is all about. You know, I'm still disappointed they never made Twilight Mr. Potato Heads. LMAO!!! Could you imagine??? Denise, glad you got such a great response. Stina, I'd have fun messing those up! OMG, what fun: "Toucan play the game." Next up: Mr. Potato Head, a really cool dude. I find the 'Mark All As Read' button terribly frightening. I have visions of hitting it at the wrong time - so sorry it happened to you! The cat did another giveaway and I missed it?! Drats. My hubby would love that Star Trek wine. And, if you still need a co-host in March, just let me know. I really enjoy it. Oh, and I can co-host, of course! I'm going to have to share the Star Trek gift ideas with my friend who is an absolute fanatic. Star Trek wine!?! So very cool, and I can think of a bunch of folks who would love getting that for Christmas. Thanks for stopping by to let me know you miss me! I'll be sending you an email from my new address in a bit. Sorry about your other communication going astray! I just opened a Twitter account so I'll start following you there, too. Be back to Blogger after the hols! Merriest of Christmases to you and yours, dear friend. Liz, just look before you click. And thank you! Suze, I was getting worried about you. Will be watching for your email. I love those geeky gifts. I might just get some myself. Cool geeky stuff. I think I'll settle for the potato head. Thanks Alex for paying a friendly neighborhood visit. I knew it was you in that ninja costume. I know I have been missing, missing a lot of stuff and missing my friends...a lot of missing happening there. Relocation, work and then my dad's illness (thankfully, a curable form of cancer) has been too much to handle. I hope to make a comeback from New Year even it is only a couple of posts a week. As for the caption, I guess Lee's thinking - "Do I have insurance - what if this damn thing hits the burly cop on the front row?" Take care. Merry Christmas and Happy new Year in case I go missing again. 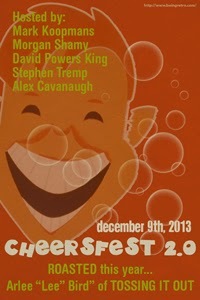 An interesting and fun CheersFest 2.0! ! My husband would love that wine! Rekha, good to hear from you! So sorry about your father although glad it is curable. And your caption is great. Laura, thanks! I can usually hit two hundred but that is my limit. I've made the Mark All as Read mistake before too, not good! Those Star Trek geek gifts are great! Especially the shower curtain one. I should get that for my mum, she'd love it. Diamonds and Dust, another book I am going to have to find. I love stories like that one. The Trekie fan ought to get a kick out of some of those Christmas gifts. CONGRATS to all those with new books out. No Star Trek gifts this year. This Christmas it's all about Doctor Who, along with some Sherlock Holmes stuff. Oh, and I'd be happy to co-host any time you need it. Now that I'm finished teaching for a semester, I'll have a lot more time. Also, congrats to Pat! What a generous giveaway. I've been taking Christopher for this test and that. *sigh* I have decided to schedule an appointment with a holistic doctor. I want to join IWSG. I just want Christopher to get better and then I plan on getting back to a full blogging schedule and I'll join the support group. Alex, this cracked me up: Is a post by Mr. Bird worth two in the bush? Yes, it’s worth two turtledoves in the bush and a partridge in a pear tree! I wish I would have joined that Fest. I loves Lee! He's such a great person. Thanks for being such a cool pal to me, Alex. It's much appreciated. Hey to the Mrs.
Annalisa, good to know I'm not alone. Rachna, I have January set - can you help February or March? Robyn, you focus on Christopher right now. He needs you the most. We're set for January hosts, but maybe one of the following months. Give you some time. Oh, those are some geeky gifts! I wish for the Harry Potter novel on a poster, but I don't think my husband would be too happy to have that hanging! i just ordered star trek shower curtain set for my British son-in-law! One of my aunts (who's never been very auntly) would probably love those Star Trek gifts. She's pretty obsessed with the show, and even has some screen name or password related to William Shatner. Thanks for the chuckles in today's post! OMG, that Star Trek shower curtain...that would make such a great Christmas gift to a number of my friends. Is wine a big thing with Star Trek fans? I don't recall it appearing much in the episodes I've seen. Congrats on the win at The Geek Twins. Such a fun contest! And I love the Star Trek gifts. Might have to think on some of them for my dad! :D Happy Friday! Hey Alex...been "off" since IWSG, so I'm getting to this a few days late. Honestly, I think I enjoyed this post the most of all of them. It was funny! LOVED the Star Trek geek chic. Too bad I'm not a trekkie. Your caption, hilarious. Perfect. You deserved to win. To top it off, you had me laughing all through the cheersfest. It truly was funny. If I don't see you before, may you and your wife have a blessed Christmas and safe New Year. And they may be filled, but if you still need another co-host for those months, let me know (asap, if January). Oh, and I see you're using Feedly. Do you prefer that to Bloglovin'? If so, why? Email me. Still trying to get all the following perfected. Love Elizabeth's title. Too fun. And River's cover gives me cover envy! Love your cheersfest post. Arlee is a lucky guy to have clever friends like yourself. I didn't know you could click the read all--probably a good thing. sounds like a mini-disaster. Mike, glad I could make you laugh. You have a great Christmas and thanks for offering to co-host next year. I love the Star Trek pizza cutter! So cool! Those gifts are awesome. I hate I missed the last IWSG for sure I won't miss the next one. That pizza cutter has my name on it. Way to go, Arlee! Looking forward to your #Tismoreblessed raffle tomorrow, Alex. I'm sure I was culled off the list, but I'm going to re-join IWSG for January. 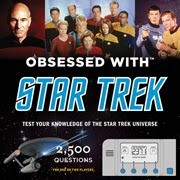 I know this, because it is on my Trekkie hubby's gift wishlist. Oh, and I imagine you got plenty of offers in the comments, but if you need me to host IWSG in the future, I'm available. March would be good. Not February or April. You know I love anything to do with the alphabet... and throw in some rhyme... it was lots of fun! Love both your captions! Congrats on winning the Who one. And I forgot, in your previosu post - sea kelp sounds intriguing! You plotters boggle my mind :-) My list-loving organizational side loves the idea of having a full, detailed, beta approved outline. But the pantster writer in me would never get the story written if I had the outline first! Merry Christmas, Alex. I hope you have an outstanding 2014. Seriously!! 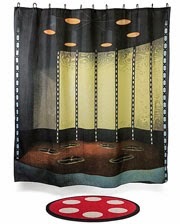 Why the hell is that Star Trek transporter shower curtain not hanging in my bathroom RIGHT NOW!!? Seriously, why the hell not!!??? Oh, and Happy Day-After-Boxing-Day / Two-Days-After-Xmas. I also wanted to mention that I just stumbled across this blog last week or so, and plan on being a regular watcher/reader/commenter/whatever. Let's all keep the blog love a-bloggin' away!! Your Dr. Who caption is hilarious! I recently a Star Trek marathon with a friend who hadn't seen the original films. I was like: "What! You haven't seen the films!?" So we watched the first couple and are going to watch the next couple in a few days. I love me some Star Trek trivia.